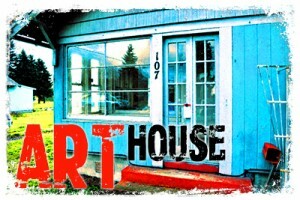 I picked up the keys in Centralia and then headed over to the Art House – entering into hostile territory. I had to tackle the first (and worst) project before I could do anything else. Mold. 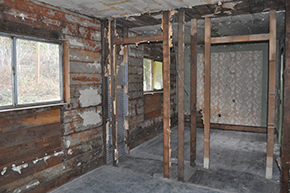 The previous owner purchased the home as an investment about a year ago, intending to remodel and flip the house, or perhaps rent it out for the rental income. She lives in Australia, so I can’t imagine how she planned to handle the project long distance. As it turned out, she didn’t. The home sat idle – no heat, no lights, no water – all the while, slowly deteriorating as the elements took their toll. In time, the west side of the roof had developed a thick carpet of spongey moss, dripping in trapped moisture. 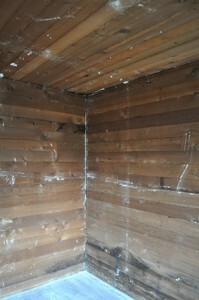 Inside, the entire west wall of the three bedrooms and bathroom became stained with the black smear of stinking mold. 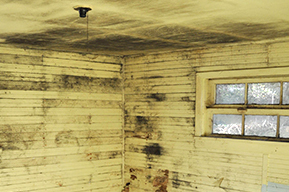 Before I was willing to purchase the house, I arranged to have a professional mold remediation company test for toxic black mold. I was NOT going to buy a problem like that! Fortunately, the test came back negative. The mold was bad, but not toxic. Now I had a choice; pay the mold remediation company $3600 for tear-out and treatment – or do it myself. After spending a miserable day in a freezing, stinking petri dish, I’m thinking I should have paid the money. When I arrived at the house, it was only 37° degrees outside, not counting wind chill, and the ground was covered in a frosty dusting of snow. 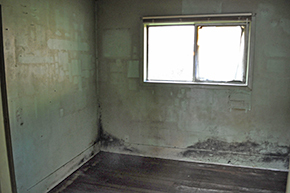 Inside, the cold temperatures had not deterred the growth of the mold – or the smell. I bundled up in multiple layers of work clothes, snapped on my rubber gloves and got down to the business of tearing out the mold encrusted sheetrock and ceiling panels. It didn’t take long for my body temperature to offset the frigid weather, but that didn’t do anything for the odor. Pee-yoo. As with any remodeling project on an old house, inevitably you peal back the layers of previous repairs and discover old problems that were covered up by shabby work-around solutions – or you find a nice surprise, like hardwood floors or beautiful millwork, or in this case, both. Underneath the mold and the crumbling sheetrock, every single wall in the house is double-clad with 3/4″ shiplap boards, inside and out. The home is built like a brick; the boards provide a cross bracing against the true 2×4″ framing that make it impossibly strong. The downside is that it will be extremely difficult to run new electric circuits, or repair the ones that already exist. But that problem is more than offset by the discovery that the mudroom/laundry room, the pantry and the studio room is actually an add-on to the original house. 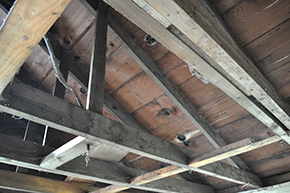 As I removed the ceiling panels, I found a network of joists that can be entirely removed without compromising the strength of the roof and walls in that area. In other words, the art studio I have planned will have an open ceiling running all the way up to the peak of the roof, with a window high-up to bring in the summer sunlight. It’s more than I could have ever wanted. Fantastic. 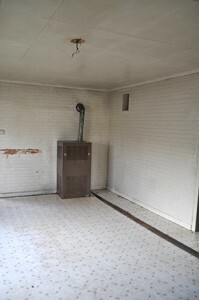 Here is a gallery of Before and After photos to give you a visual of the highs and the lows of remodeling an old, old house. BEFORE: The walls of the studio space were stained with mold, black and stinking. AFTER: Removing the moldy ceiling panels revealed open space and a high window. So cool! BEFORE: It’s a smaller house with small bedrooms. The mold doesn’t help. AFTER: Tearing out the wall between Bedroom 1 and 2 creates a huge master bedroom. BEFORE: The walls and floors were covered in linoleum, old paint, musty sheetrock and flowered wallpaper. AFTER: Removing wall and floor coverings revealed solid wood. 3/4″ shiplap on every wall and hardwood flooring.